BERLIN - One of the top three tiltrotator manufacturers in the world has set up shop in Berlin. Steelwrist, based in Sweden, held a ribbon cutting for its nearly 10,000-square-foot facility that opened about six months ago at 576 Christian Lane. The company, which has around 160 employees in total, makes tiltrotators, excavator attachments that can tilt and rotate and are interchangeable in a matter of seconds. The company has about $50 million in sales annually in 30 countries, Stockhaus said. 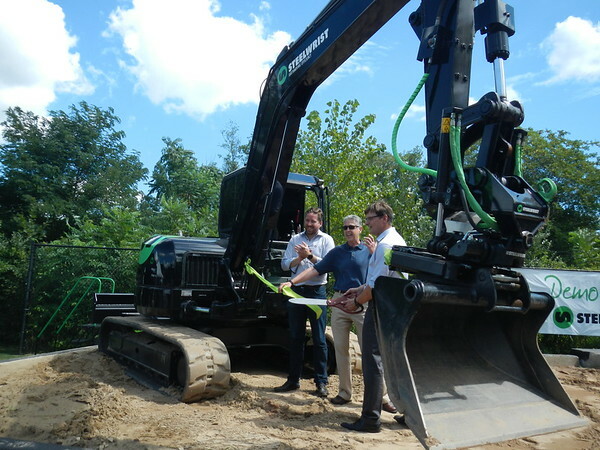 The tool makes work efficiency 100 percent better, said Anthony LaFata of LaFata & Son Inc. Excavation Contractors and A&D Equipment Sales at the ribbon cutting. The company was considering New Jersey and Connecticut for its American operation, Stockhaus said. Connecticut was chosen largely because it is only six time zones away from Sweden, is close to New York City and its port facilities, and has many manufacturers that deal with excavators, Stockhaus said. But what finally sealed the deal was aesthetics. “At the end of the day, this is a nicer area than the area of New Jersey,” said Stockhaus, adding it’s also a nicer place to live in for employees. “How they ended up in Berlin … is fantastic” said Mayor Mark Kaczynski at the ribbon cutting. However, Stockhaus said the process to expand to the U.S. took longer than expected. The company started looking into the idea in 2015. “It is more difficult to start up a company here than it is in (South) Korea,” said Stockhaus. He added there are regulations specifiying how many parking spaces a businesses is supposed to have, for example. In Sweden there’s none of that, Stockhaus said. Three employees work in Berlin now, but the plan is to have 10 within the next 36 months. The site was previously the home of Roto-Rooter and specialty gas provider Tech Air. About $1 million was invested to make the location one big building and update it, Steelwrist’s U.S.A. president, Christian Yanes, said. No town or state economic incentives to open up in Berlin were used by Steelwrist, said Edge. Charles Paullin can be used at 860-801-5074 or cpaullin@centralctcommunciations.com. Posted in New Britain Herald, Berlin, Business on Thursday, 30 August 2018 20:36. Updated: Thursday, 30 August 2018 20:39.